After the excitement of receiving a wedding invitation subsides, it’s time to dig into the fancy envelope — and there’s a lot to dig into. Feeling a little lost among all the cards and inserts? 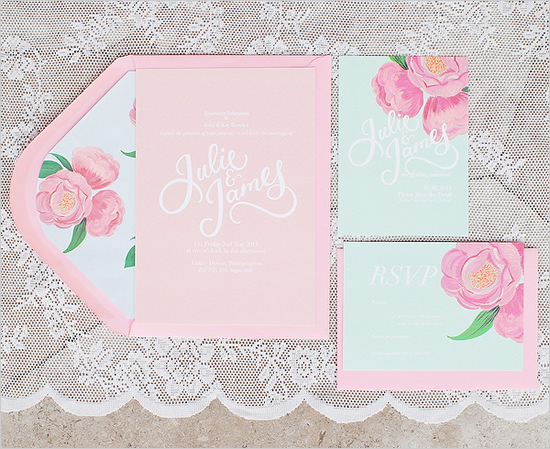 This guide will help you decipher every piece of paper in the invitation suite. You may not think the envelope is that important, but it tells you a crucial detail: exactly who is invited to the wedding. The main card in the invitation is what will have they key big day details. On there, you’ll find the names of the nearlyweds (you know, the people who invited you to their wedding). You should also find the date, time and location of the ceremony. Pro tip: You actually do need to arrive before the time listed — fashionably late is not a thing for wedding ceremonies. Then, you might find a short line that says something like “Dinner and dancing to follow.” That’s your cue that there’s a reception afterward. Couples sometimes get creative with this phrase — maybe it’ll say “The backyard celebration starts right after.” This line might give you a clue about the formality and style of the wedding. The invitation could also include a note about the dress code: It might say “Black tie requested” or “Semi-Formal Attire.” If it doesn’t, you’ll have to use the formality and language of the invitation to gauge the dress code. Finally, keep an eye out for the wedding website. That’s where you’ll find any details not included in the invitation suite. Plus, the couple will likely share registry info on the site. While increasingly less popular, some invitation suites will still include a separate, smaller card with details about the reception (otherwise those details will be on the main invite). It might include a different time and location. Take note of how much time will be in between the ceremony and the reception — that way, you can make a plan to keep yourself busy before the party starts. Important: This is the one you’re supposed to send back! It’s how the couple will know whether you’re attending the event — and yes, you actually do have to RSVP, and you have to do it on time! Most will include a “deadline” to respond, and if it doesn’t, just send it back ASAP. There should be a small self-addressed stamped envelope to send the card back to the couple (although some of these cards may be set up as postcards). The card will likely include a space to write in your name (and your guest’s name, if you’re allowed to bring a date). If the line starts with M____, use the M as a way to start your title (Mr., Miss, etc.). The response card also might give you an opportunity to select your meal, letting you choose between a couple of entree options. Be sure to select one (for you and for your guest) so you get the right food for dinner. If you both want the same meal, write a “2” on the line next to your selection. – Information about lodging. The couple may have a hotel block, where you can get a room with other guests, often at a discounted rate. Or, they may simply offer suggestions for nearby hotels. Note: You don’t have to stay in the hotels listed on the card — feel free to find your own lodging. – Transportation information, like if there will be a shuttle bus from the venue to a hotel. – Directions to and from the venue or a map of the area. This is super useful to have, so make sure you stash it in your pocket or purse on the big day. If you’re in the wedding party, you’re a relative, you’re very close with the couple, or you’re traveling a very long distance, you may spot an invitation to the rehearsal dinner tucked into the envelope. Although if you don’t see one, don’t assume your Friday night is free just yet. Depending on the couple’s preference and who is hosting, it might come as a separate invite.